We’ll take half an hour to put this salad together so we’ll be off the hook for cooking for a couple of days. 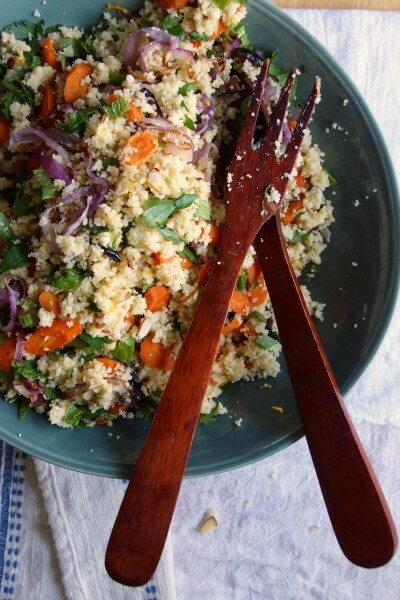 Grab couscous and almonds from the pantry, carrots, onions, olives, and mint from the refrigerator. 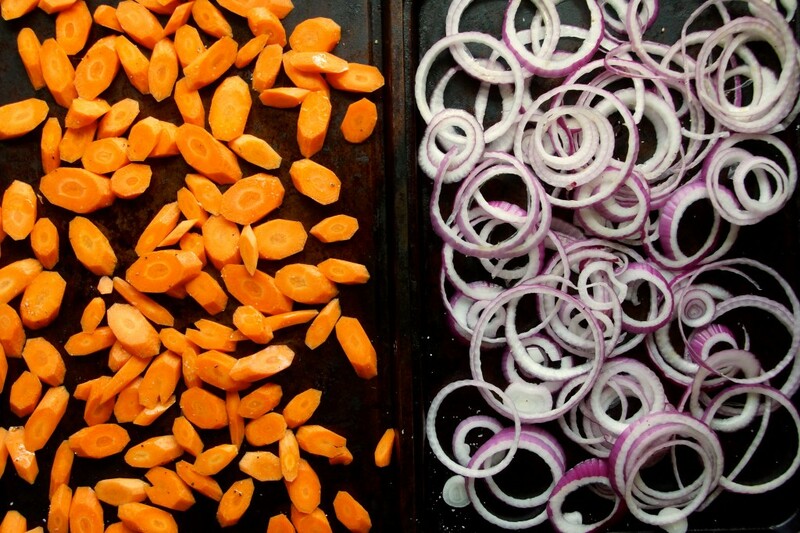 Chop and slice the carrots and onions and pop them in the oven to brown and sweeten. 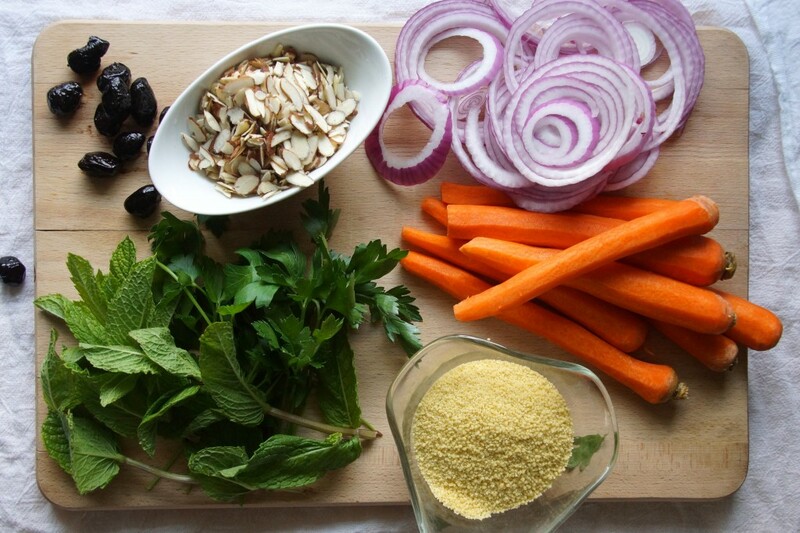 While you’re waiting, cook the couscous, chop the olives, and run a knife through the herbs. Dress the couscous with yogurt, orange zest, a splash of vinegar, black olives, almonds, and a pinch of red pepper. Add the roasted veggies and herbs and toss. And there you go–a quick, easy salad that will provide a bunch of effortless late night dinners or lunch box treasures. We’ll save fancy and elaborate for another day. I am at peace when I know there is a big, tasty salad in the fridge. This salad will hold up well for days and is great for lunch or served as a side for dinner. Preheat oven to 400°. Lightly coat the carrots and red onions in olive oil, season with salt and pepper. Roast until the carrots are just tender and the onions are browned in spots, 20-25 minutes. Meanwhile, cook the couscous. Bring 2 c. water with a pinch of salt and 1 Tbsp. of olive oil to a boil. Stir in the couscous, remove from heat, cover, and let stand for 7 minutes. Fluff with a fork and transfer to a large salad bowl. Toss the couscous with the almonds, yogurt, orange zest, red pepper flakes, and vinegar. Add the roasted vegetables and herbs and toss. Season, if necessary, with salt and additional red pepper. 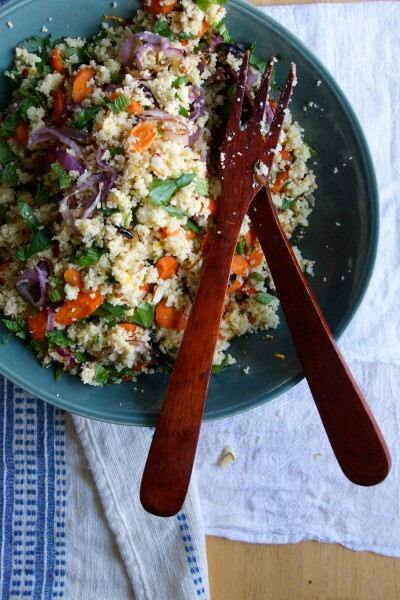 This couscous salad is good served warm when it is first made or straight from the fridge later in the week. 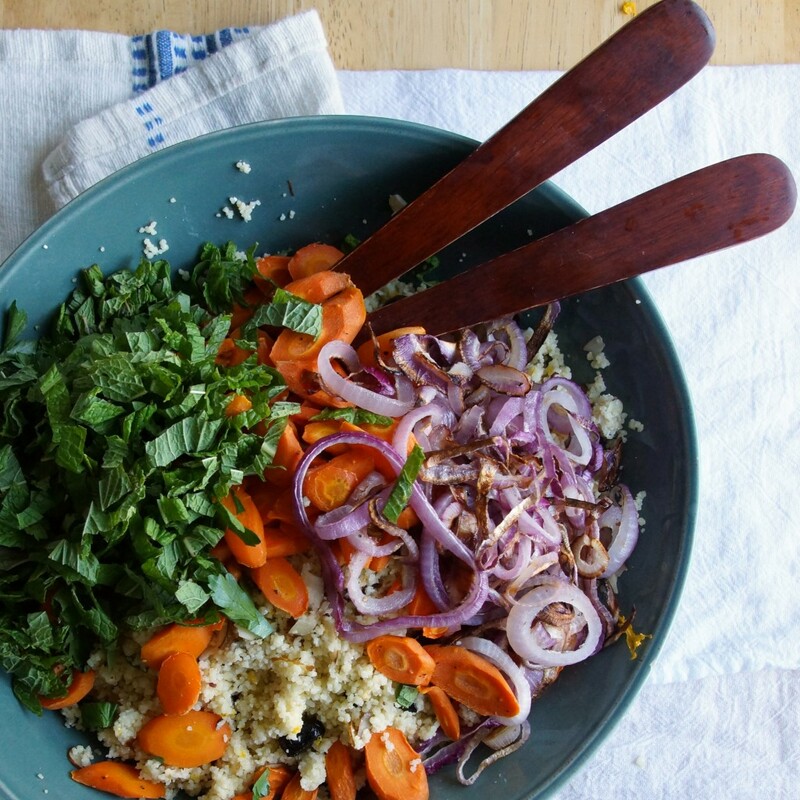 Your salad concoctions are always amazing – I’m sure this one is, too. I really need to transplant some of my mint in your backyard….. I love this salad. 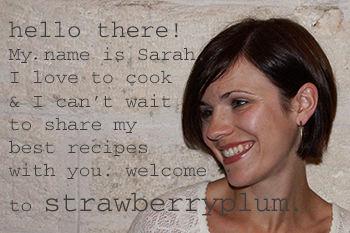 I have made it a few times and took it as a veggie alternative to a BBQ and everyone loved it. You hit the mark with this one and is already a repeat recipe for my family. Thanks for sharing!